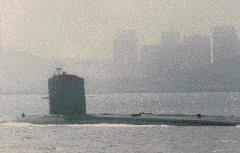 The USS CAVALLA (SSN 684) is the second U.S. submarine to bear the name. Both built by the Electric Boat Shipyard in Groton, Connecticut, the first CAVALLA (SS 244) was the fore-bearer of today’s CAVALLA (SSN 684), a nuclear-powered fast attack submarine of the STURGEON class. SS 244’s outstanding success in the Pacific theater during World War II included the sinking of the aircraft carrier SHOKAKU and the award of the Presidential Unit Citation along with four battle stars during her six war patrols. 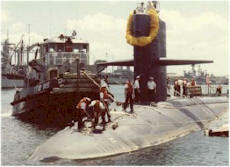 The modern day CAVALLA (SSN 684) has compiled a similar storied history during her nearly 25 years of operation. Commissioned on 9 February 1973, her operations have spanned the Atlantic, Pacific, Arctic and Indian Oceans. Originally operating out of Groton, Connecticut, CAVALLA conducted numerous Atlantic and Mediterranean deployments. After transiting the Panama Canal in September 1978 and being assigned to the Pacific Fleet Submarine Force, CAVALLA completed the first of her two overhauls in Puget Sound Naval Shipyard. Presently assigned to Submarine Squadron ONE in Pearl Harbor, Hawaii, CAVALLA has conducted numerous Western Pacific deployments. 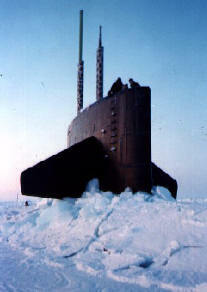 Some of CAVALLA’s noteworthy firsts include the Navy’s Drydeck Shelter Operations in 1983, the first ever Submarine Ice Expedition to the Arctic Ocean with civilian scientists embarked in 1995 and the first ever joint United States/Japanese Deep Submergence Rescue Vessel Operations in 1996. Continually modernized and upgraded, CAVALLA demonstrates the full range of today’s attack submarine capabilities including Special Warfare (Drydeck Shelter Operations), Mine Warfare, Strike Warfare/Tomahawk Cruise Missile Operations, Anti-Surface and Anti-Submarine Warfare and Reconnaissance. USS CAVALLA (SSN 684) has earned the Navy Arctic Service Ribbon, the Sea Service Deployment Ribbon, the National Defense Service Medal, the Navy Expeditionary Medal, the Navy’s Battle Efficiency "E" (three awards), the Navy Unit Commendation (two awards) and the Meritorious Unit Commendation (two awards). Grateful acknowledgements to COB John C Veverka and ETC(SS) Pat Miller.